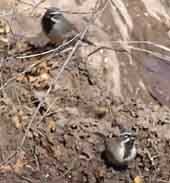 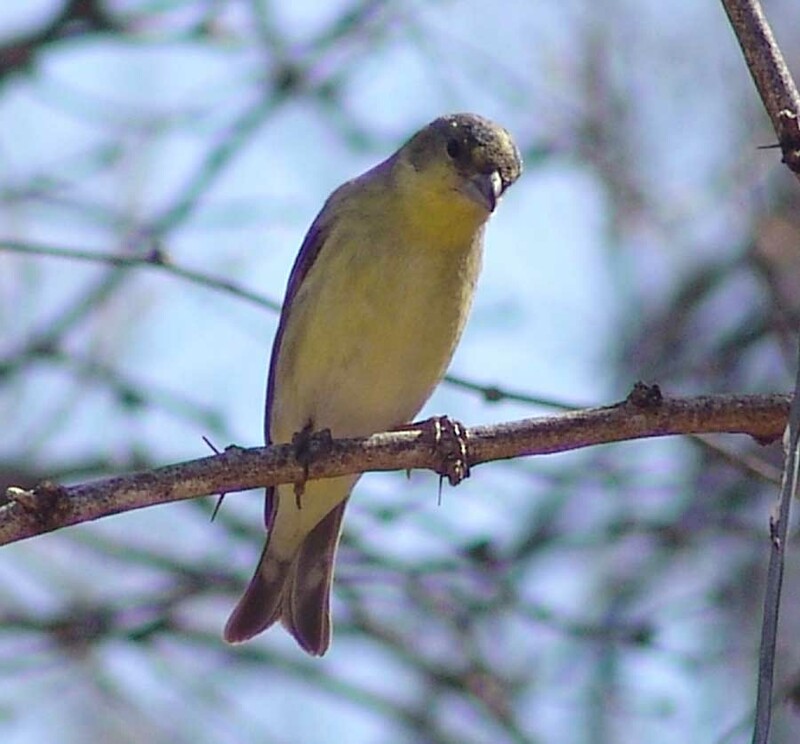 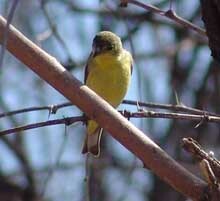 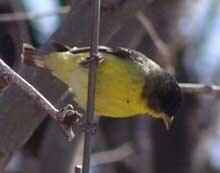 These small, rather inconspicuous birds live in our area year-round, and usually move about in flocks. Photographed at a pool in lower Hot Springs Canyon in February 2006. 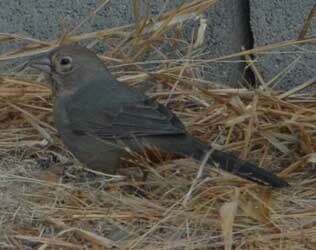 This bird winters in our area but breeds in summer further north and/or at higher altitudes. 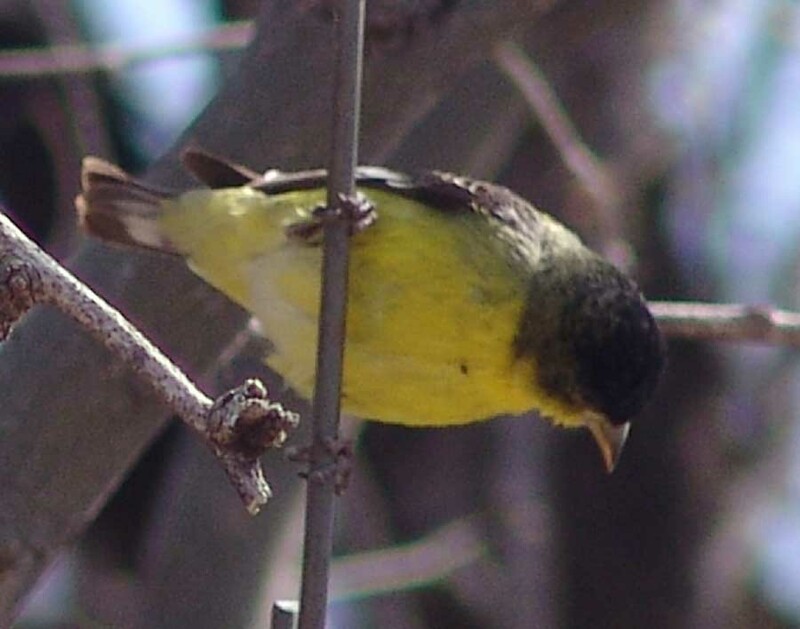 Above left, a male Lawrence's, showing the black face mask that clearly distinguishes it from the Lesser (these are also larger goldfinches than the Lesser). 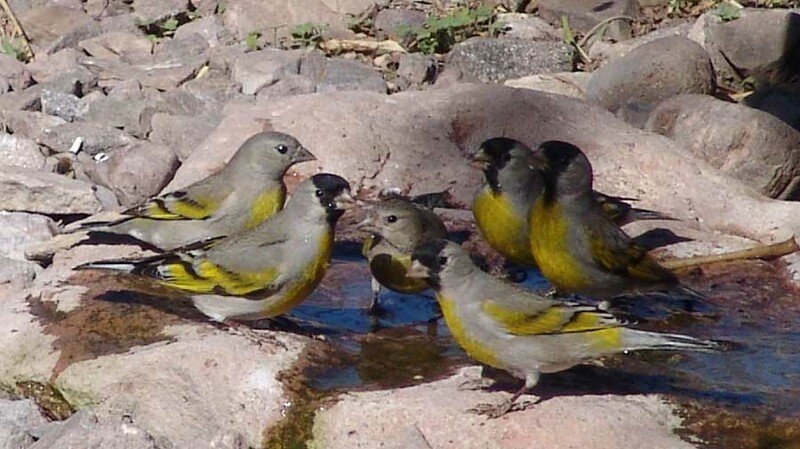 Above right, females are at left and center, their gray heads setting them off from the males, while all Lawrence's have the pale gray bodies and strong yellows on their wings. 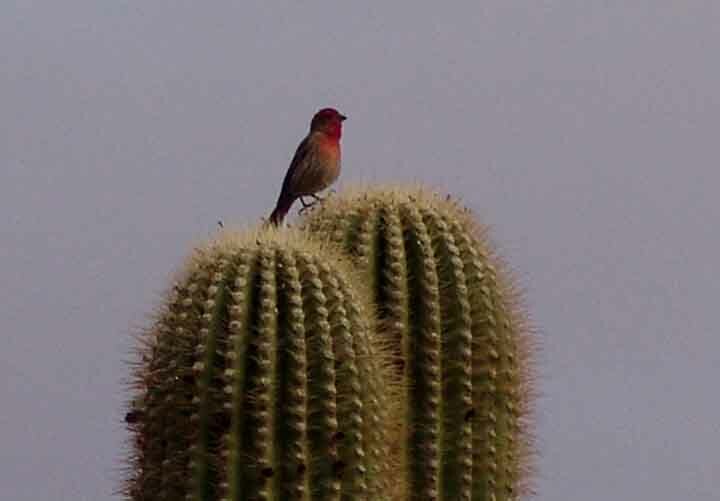 Lawrence's winter in southern Arizona and adjacent Sonora, but summer in California. 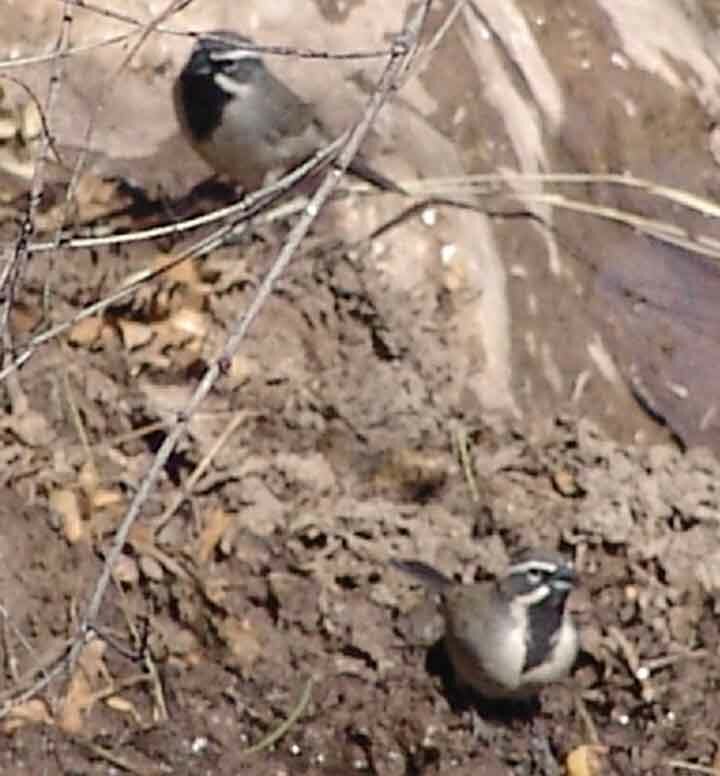 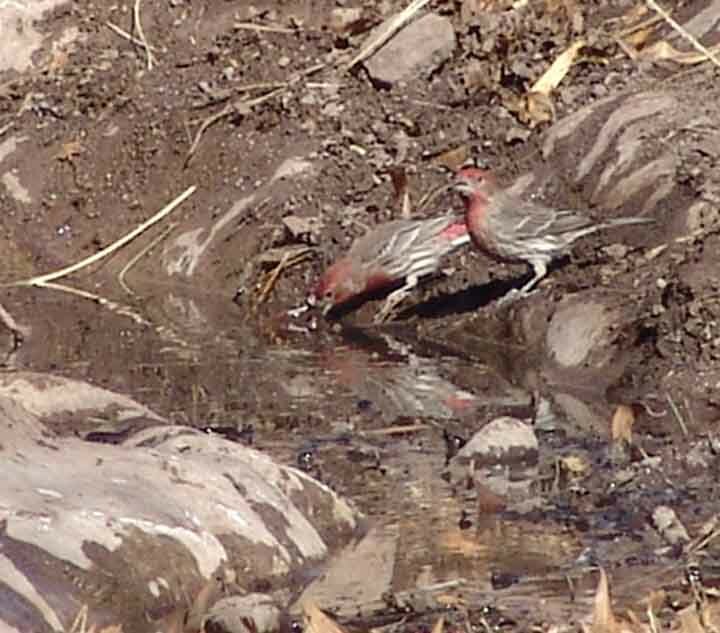 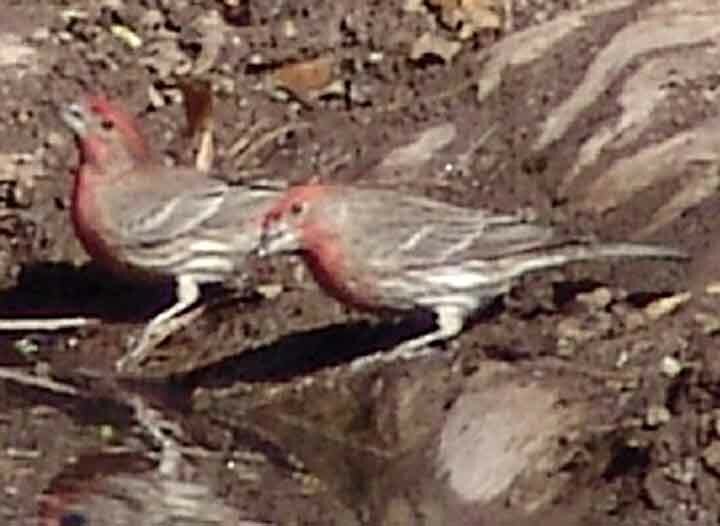 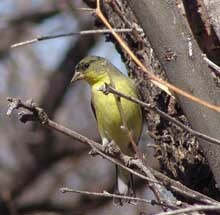 Common in our area, these birds below were taking advantage of Jim's Willow Spring in January 2006. 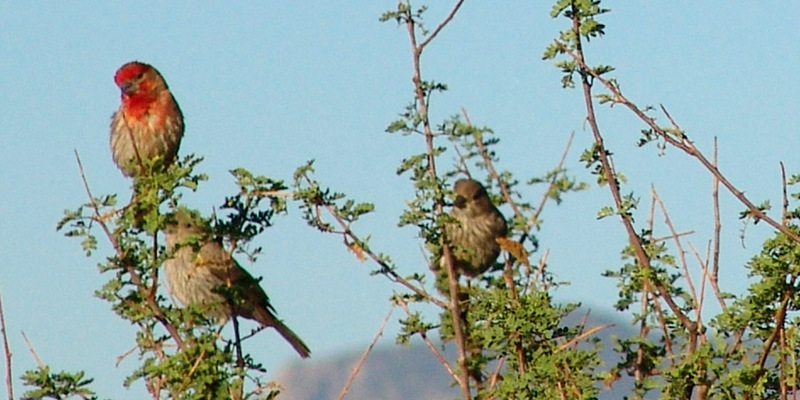 This one at left was singing, perched atop the Rabbit Ears Saguaro at sundown in late March 2006. 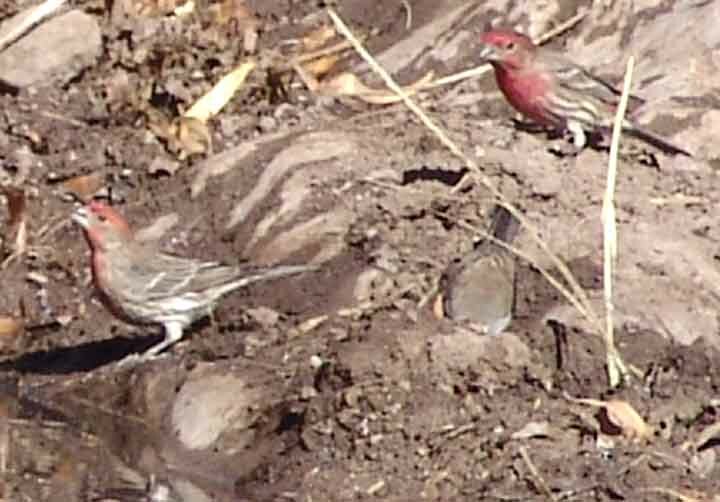 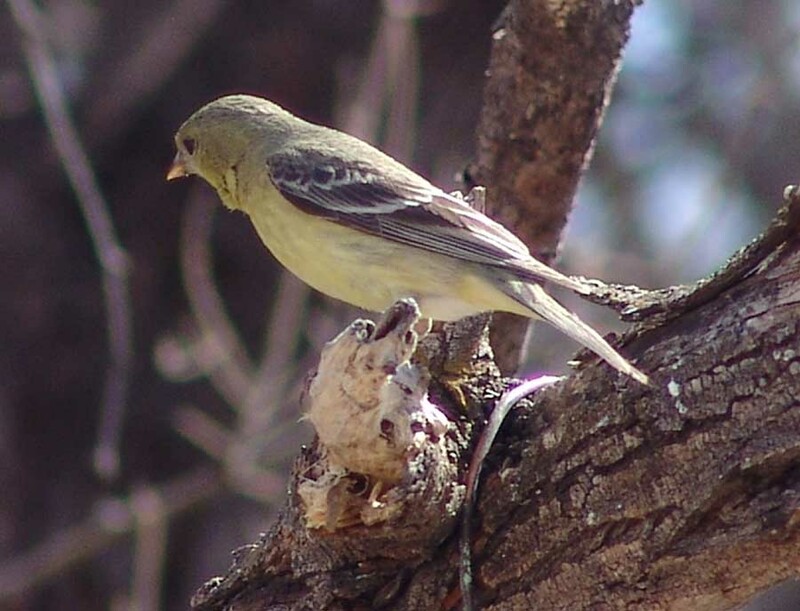 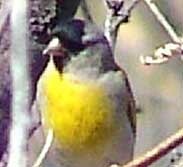 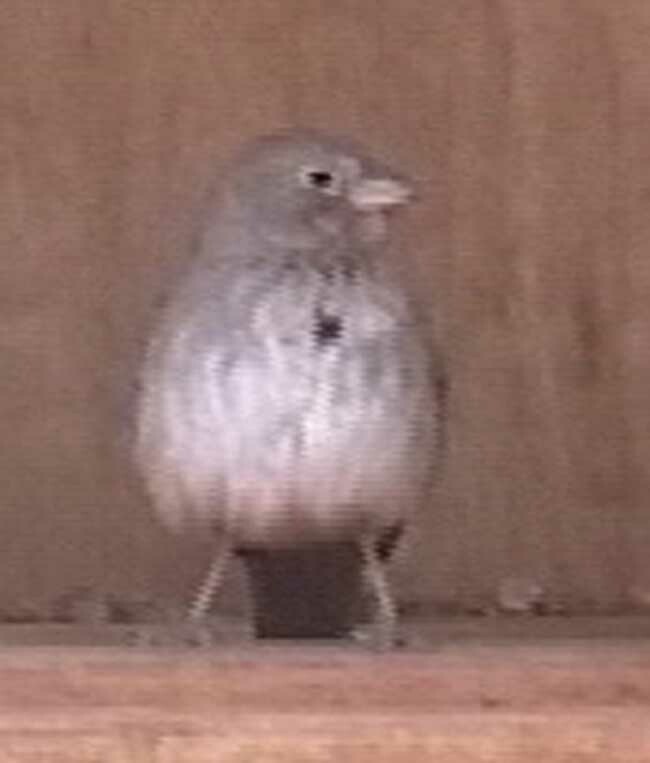 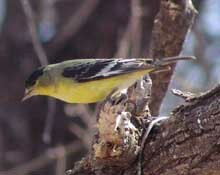 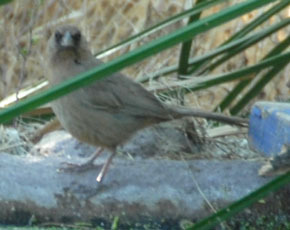 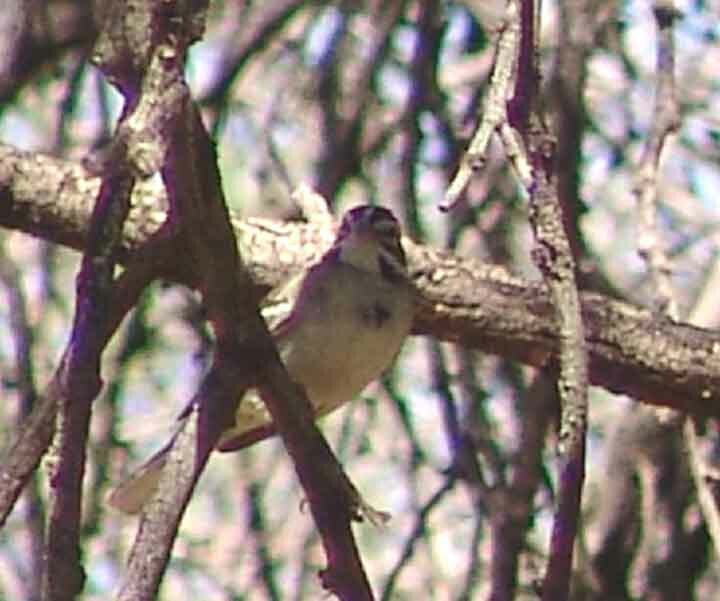 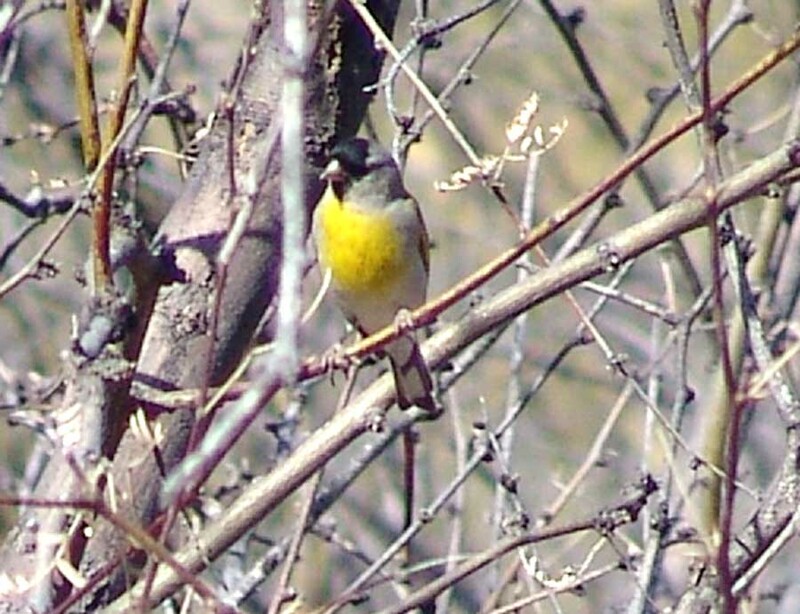 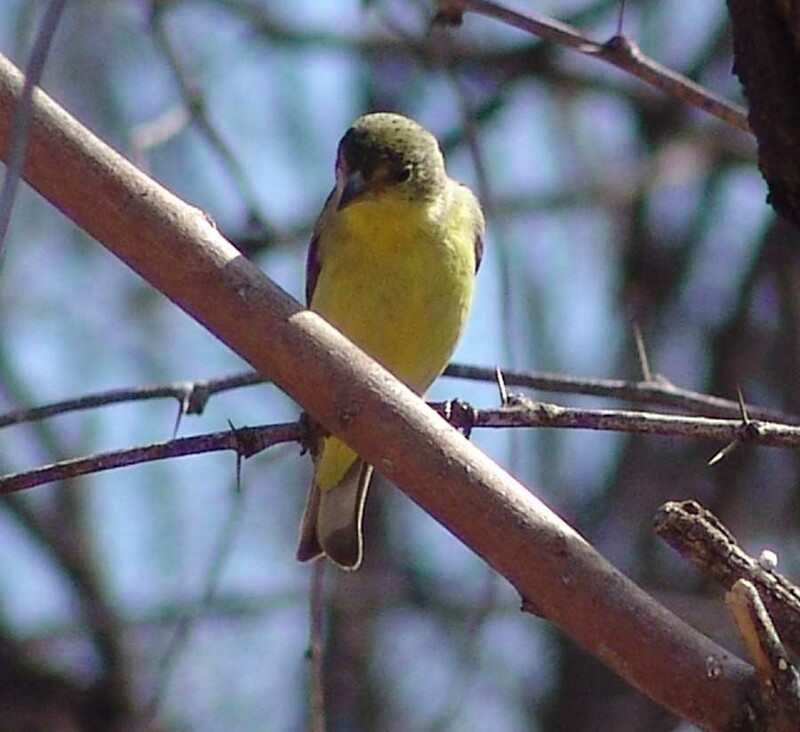 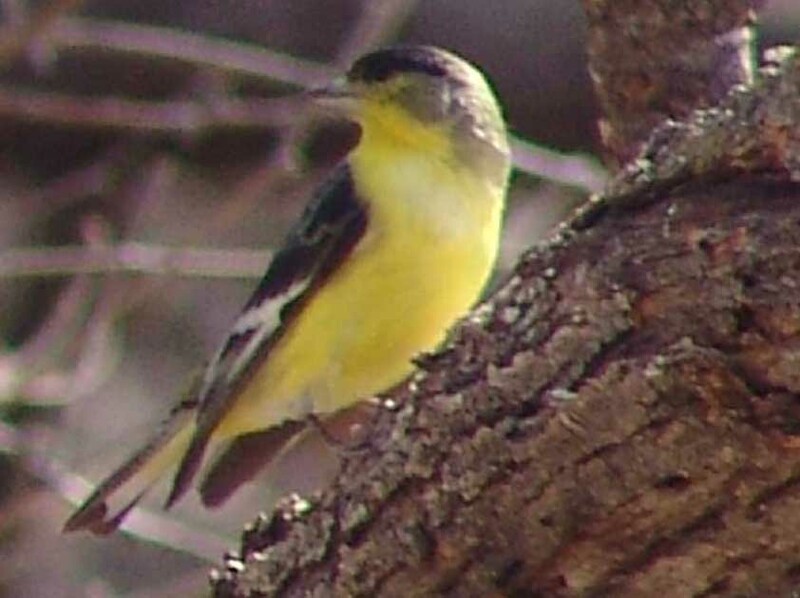 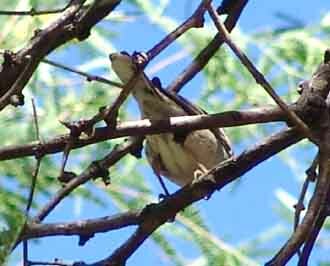 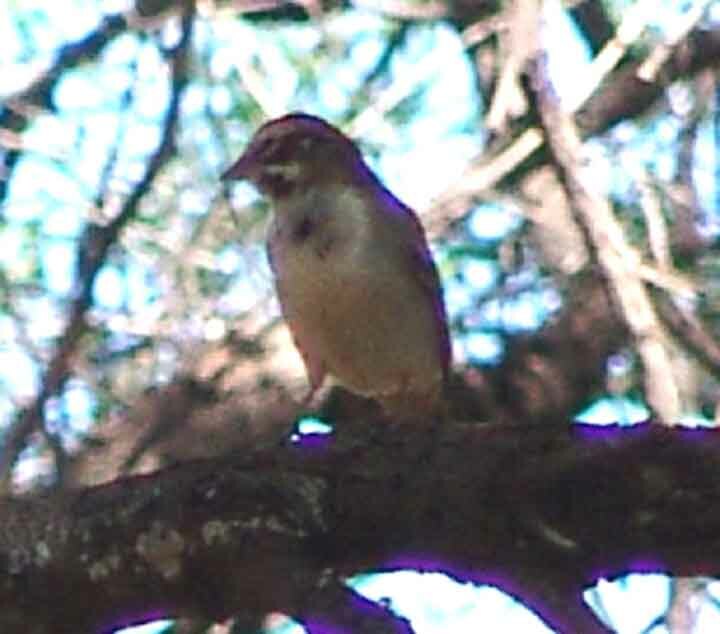 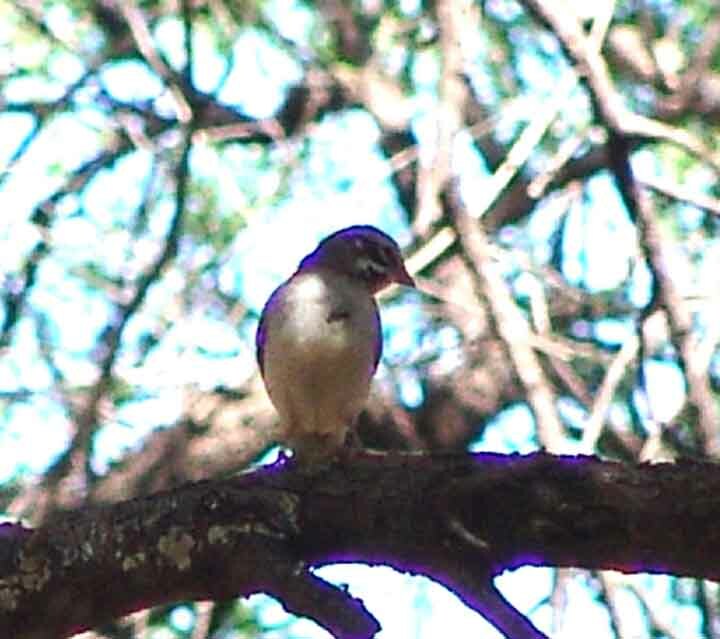 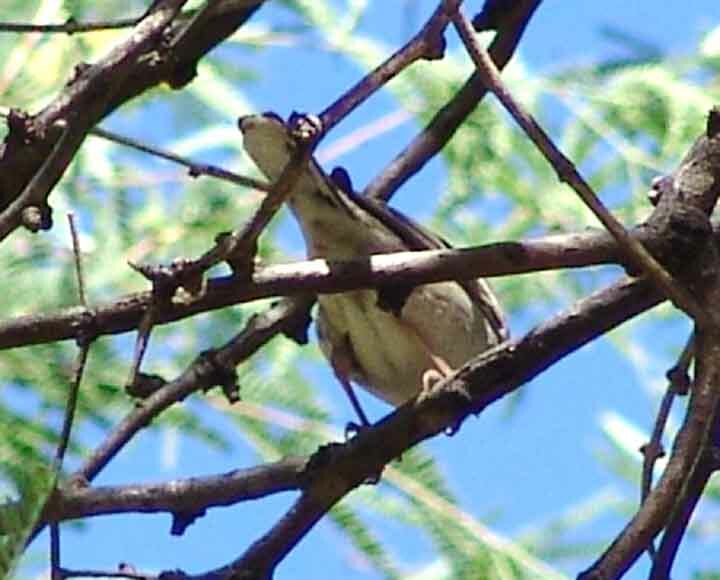 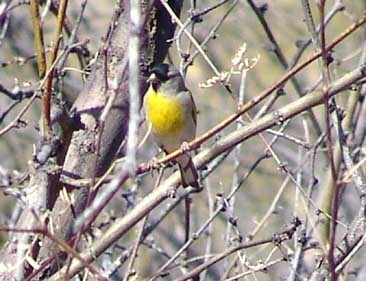 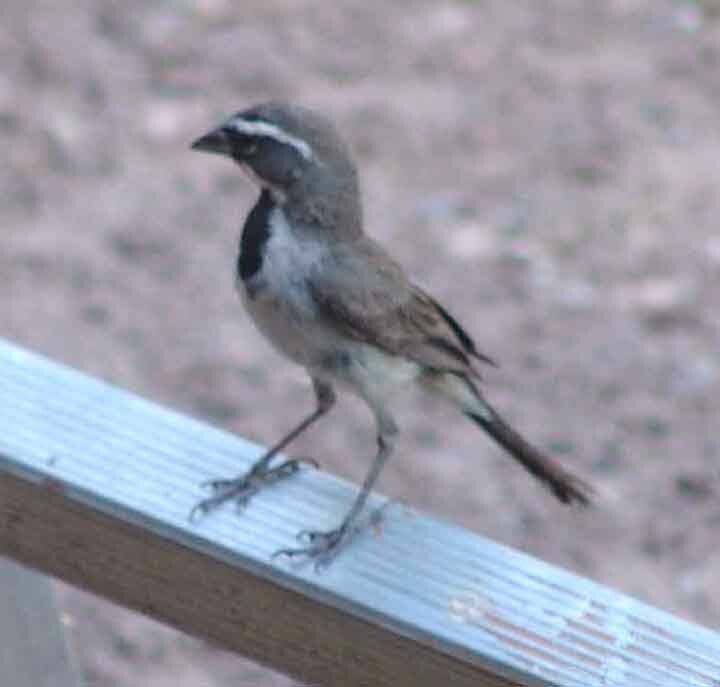 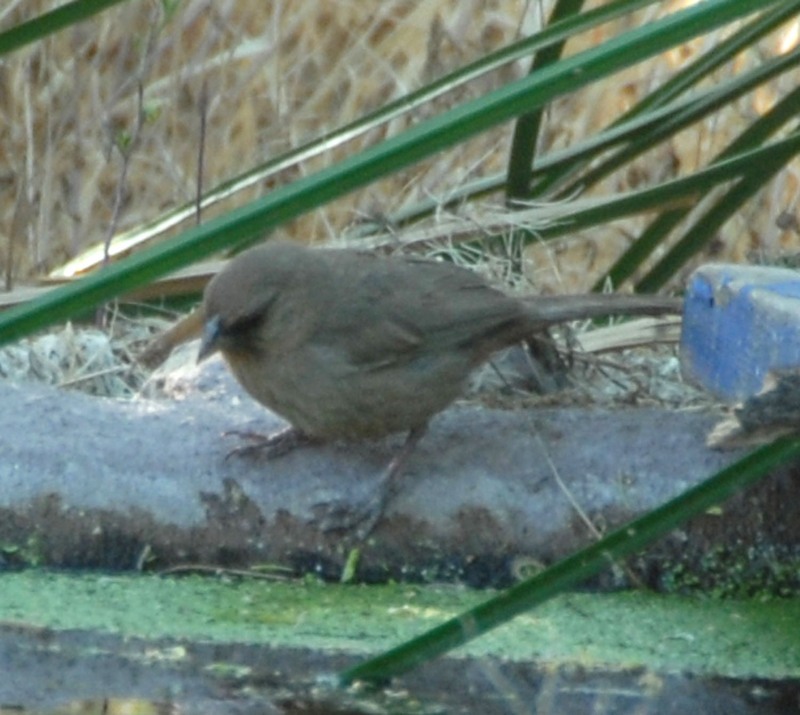 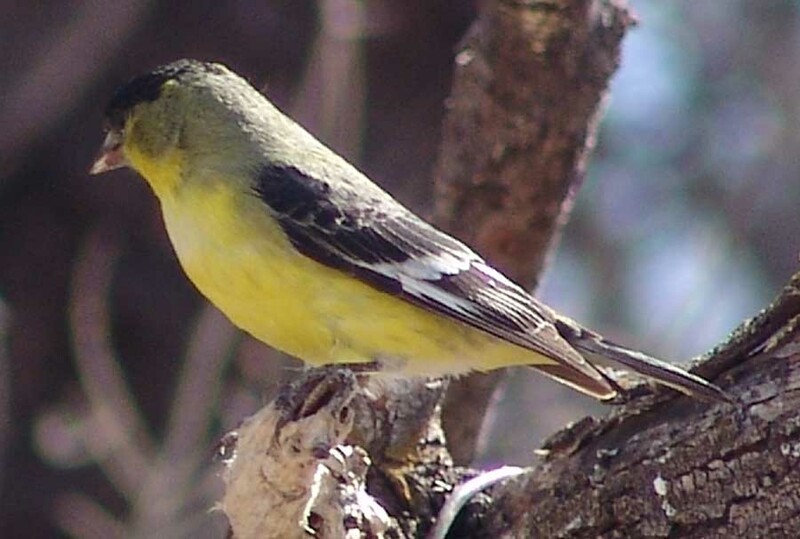 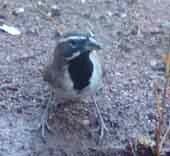 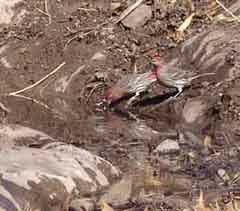 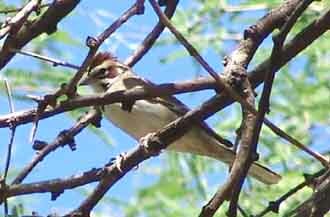 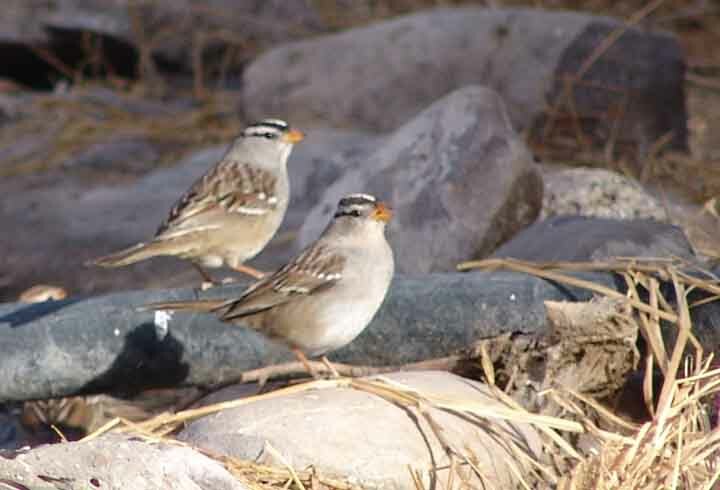 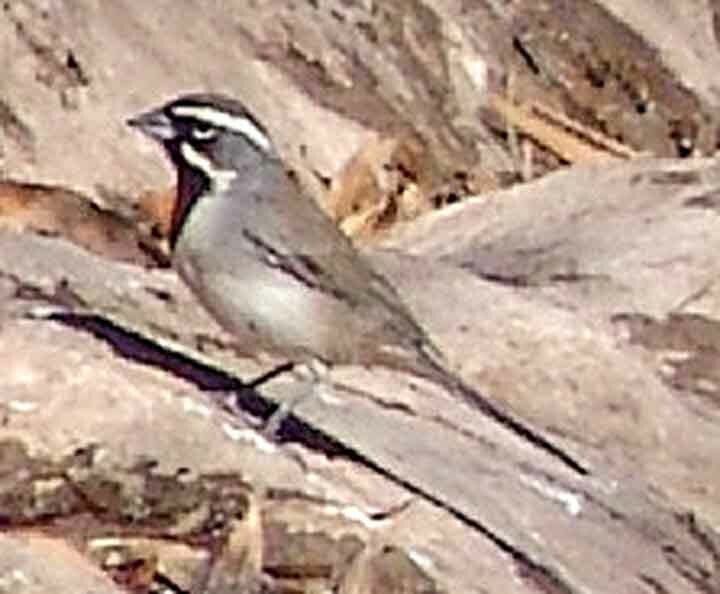 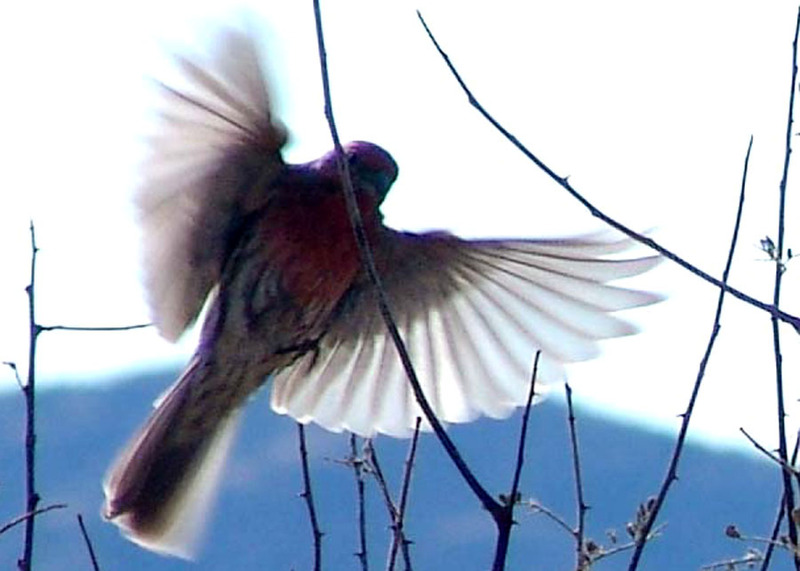 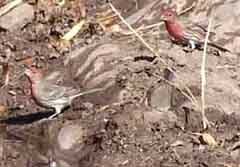 This bird (above, photographed in November 2007 in lower Hot Springs Canyon) is common in our area year-round. 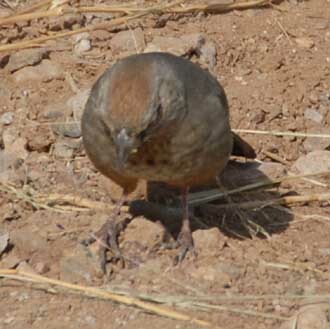 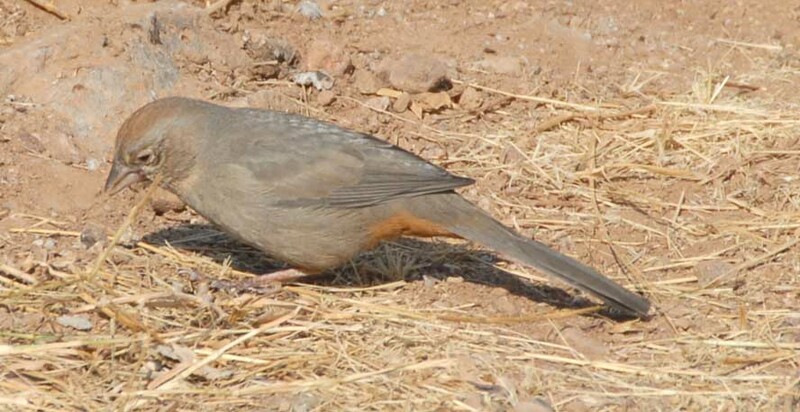 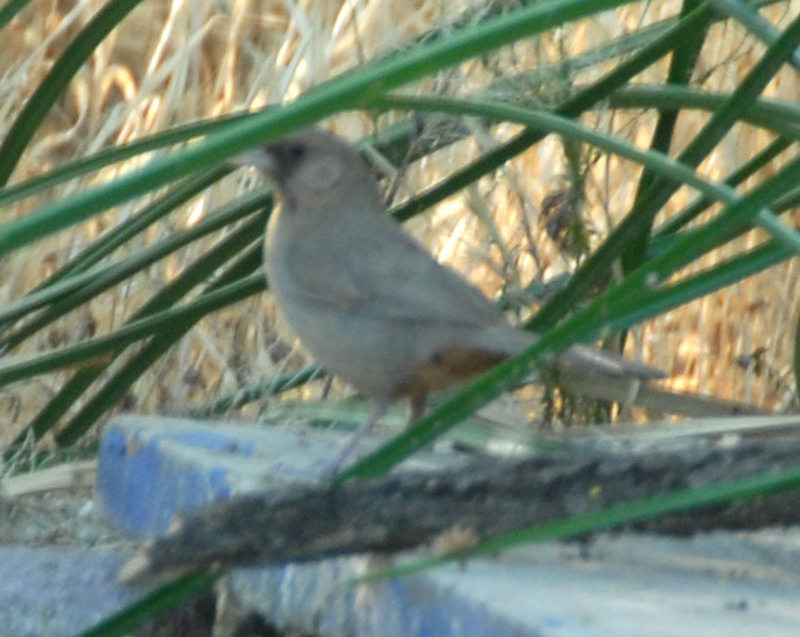 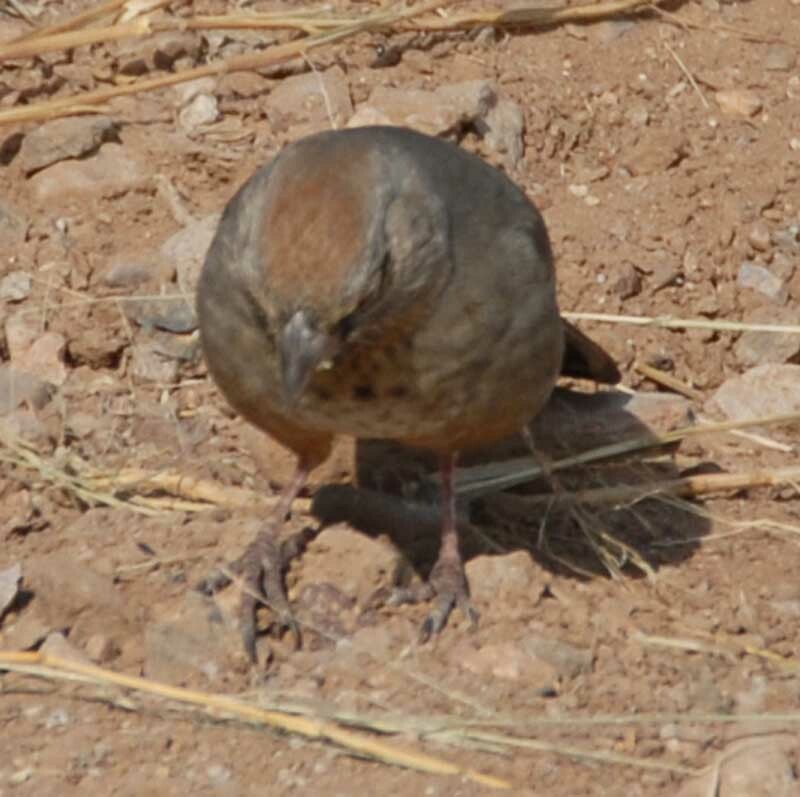 Towhees live in dense brush but often forage on nearby open ground (in summer for insects, in winter for seeds). 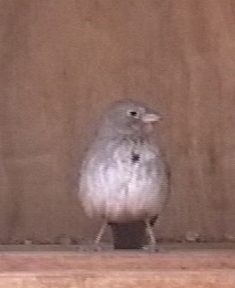 One other feature noted by Sibley (2000, p. 476) is the presence of "a "distinct 'necklace' of dark spots" above the breast spotting of this bird. 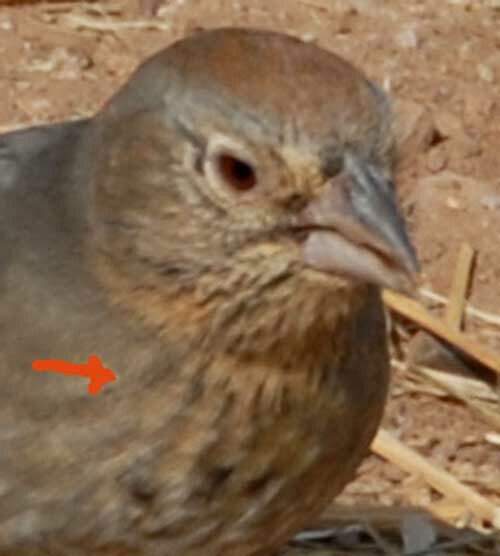 These are evident in the image above right, and also faintly evident in our November 2007 bird, below, indicated by the red arrow.